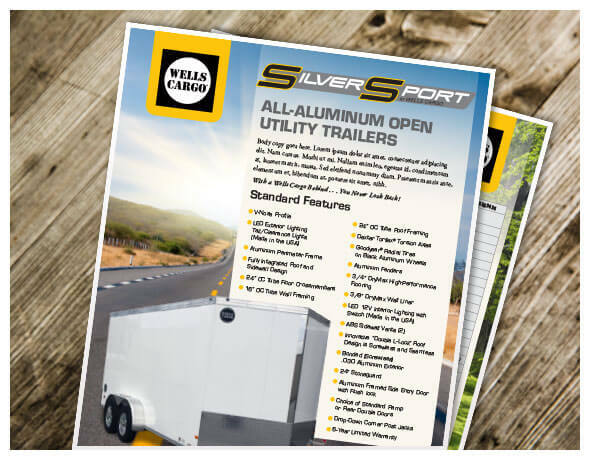 The Wells Cargo SilverSport In-Line Snowmobile Trailer is designed to efficiently and effectively transport your snowmobiles. Aligned in a row from front to back, the In-Line model allows for quick getaways and streamlined towing. The industry leading 7’6” body width delivers a spacious 831/2” between wheel boxes. Capacity 7000 lbs. 7000 lbs. 7000 lbs. GVWR: 7000 lbs. 7000 lbs. 7000 lbs. Front Door (W x H): 73” x 60” 73” x 60” 76" X 60"